Government agencies are challenged to identify valuable risk insights and turn them into actionable protective measures. Often, behavior analytics tools can provide various insights into risky and anomalous activity, but do not enforce agency protection policies. Forcepoint is a key partner to government cybersecurity strategy, with solutions scaled to support agency security programs. Our risk-adaptive approach integrates best-in-class products with analytics and behavioral profiling, bringing agencies near real-time risk insights and automated remediation to better protect critical data, wherever it resides. 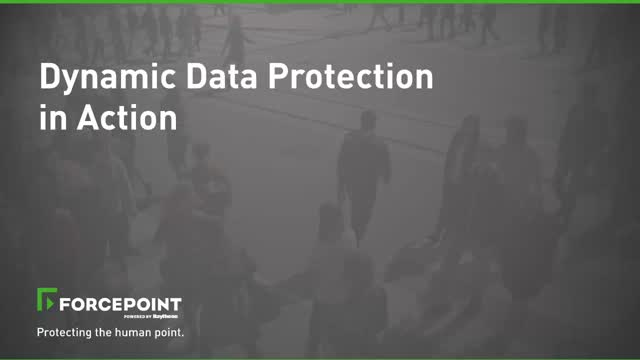 In this brief, 10-minute webinar, we will demonstrate how Dynamic Data Protection (DDP) from Forcepoint helps surface anomalies and proactively adjusts individualized data security controls in near real time with proactive, dynamic security. Often, when implementing the NIST Cybersecurity Framework, security teams spend too much time responding to alerts and security events, and far too little on concurrently and continuously focusing on post-breach planning and recovery. Watch this webinar to learn how adopting a risk-adaptive security approach can help agencies better align resources and better plan for evolving security requirements. As cyber threats continue to escalate in scale and frequency, it is imperative that cross domain solutions (CDS), which protect the world’s most sensitive data, comply with latest set of guidelines. Michelle Jordon, Forcepoint Global Governments Information Principal Cyber Security Manager, discusses “Raise the Bar,” an initiative created by the National Security Agency’s (NSA) and NCDSMO to combat rising threats while continually improving the status quo in the cross domain community. Now is the time to prepare. Innovation thrives when people can collaborate in a trusted manner, leveraging data creatively and freely through technology. This intersection is also the point of greatest vulnerability for your agency and the primary source of security breaches driving cyber risk to all-time highs. In 2019, attackers will stop at nothing to steal our identities, evade detection through new techniques, and bring disruption to our doorsteps. The stakes are high, the world more connected than we could have ever imagined. Join Forcepoint's Raffael Marty (VP Research & Intelligence) and George Kamis (CTO Global Governments & Critical Infrastructure) along with Raytheon's Brett Scarborough (Senior Manager, Cyber Business & Strategy Development) for a discussion around the most pressing cybersecurity issues for government – and what agencies can do to protect against them. As agencies modernize their security and data continues to move to the cloud, it’s critical to extend the same protections that you have on premises to the cloud. Government-wide, agencies are urged to prioritize digital transformation so defense and civilian agencies have reliable and secure digital experiences whenever and wherever they need. But too often, agencies procure new contracts to build on legacy networks that either are inadequate or don’t sufficiently support emerging technologies that can help meet growing cyber demands. In this Roundtable Webcast, sponsored by MetTel and Forcepoint, Mark Bunn, program manager for DHS’s Trusted Internet Connections, discusses agency needs in networking and cybersecurity. On Oct 2, Forcepoint gathered Continuous Diagnostics and Mitigation (CDM) leaders from SBA, DOE, NASA, GSA, and more to explore the current state of CDM and what practical next steps agencies should consider as they move their CDM programs forward. In Hour 2, hear directly from agency and prime CDM leaders as they share best practices, pain points, and insights on their unique approaches to CDM implementation. In Hour 1, get CDM implementation insights and tips from Sanjay Gupta of the U.S. Small Business Administration, the first federal agency to implement CDM in the cloud. The event also previewed the results of a recent Market Connections survey of civilian agencies within each of the six CDM task order groups, highlighting key adoption challenges as well as first-hand best practices and recommendations for CDM success. Hear about the current pulse on CDM from Market Connections President Aaron Heffron. Network protocol normalization and reassembly is the basis of traffic inspection performed by next generation firewalls (NGFW) and intrusion prevention systems (IPS). But even common network protocols are complex, with multiple possible interpretations for the same traffic sequence. In this webinar, learn how targeted protocol stack fuzzing can be used for automated discovery of traffic normalization errors. Attackers can use these errors to evade detection, bypass security devices, and allow exploits and malware (including aggressive ransomware attacks like WannaCry) into your network undetected. We will demonstrate how many up-to-date security devices still have vulnerabilities to basic evasive techniques and how to test your solution’s efficacy. Government networks must evolve, or other IT modernization and digital transformation efforts will fail. To be successful, you need a new approach to network security and connectivity—a combination of agile, direct-to-cloud connectivity, strong security anywhere your systems touch the internet, and efficient control and management. Government agencies have unique and complex cybersecurity challenges that are worsened by an understaffed workforce, legacy IT systems, and a lack of modernization funding. Security teams are constantly bogged down with alerts from disparate point products that require manual investigation. With Forcepoint Dynamic Data Protection, you can take your agency from yesterday’s threat-centric model to a more proactive approach focused on human behavior. We combine our best-in-class data loss prevention with behavioral analytics to reinforce security without hindering productivity. Watch our webcast to find out how Forcepoint DDP can deliver risk-adaptive security and help your agency protect its most sensitive data. Risk-Adaptive Data Protection (RADP), a key component of Forcepoint’s Human Point System, uses risk-adaptive scoring to recognize the context and intent of user behavior for early and accurate threat detection. RADP delivers a better understanding of risky behavior and the ability to automate policies to dramatically reduce the quantity of alerts that require investigation. It cuts through the noise so you know where to focus. In this webinar, Forcepoint experts discuss the origins and evolution of CDM and how agencies can leverage this program to build RADP into their cybersecurity posture.